Donald Trump thinks that even "Saturday Night Live" is part of a media conspiracy to bring down his presidential candidacy. 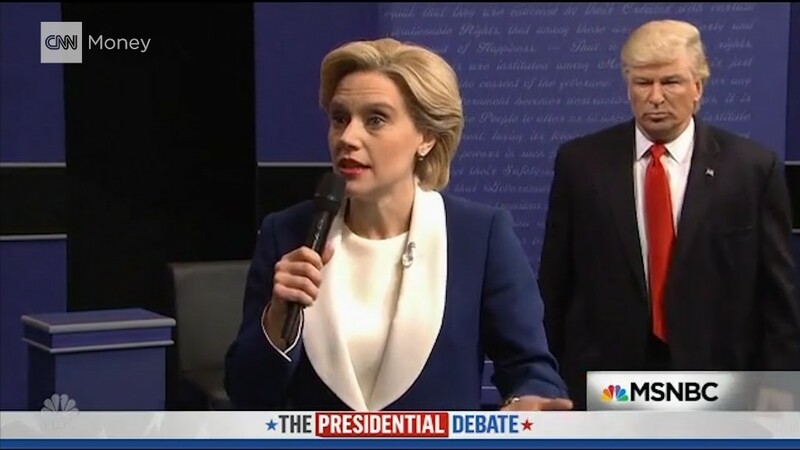 Saturday night, SNL opened with a mocking reenactment of the second presidential debate. The parody included the moderators taking shots, a kung fu style greeting between Trump and Hillary Clinton and an ode to town hall questioner -- and 15-minute celebrity -- Ken Bone. But the biggest laughs came from Alec Baldwin's portrayal of a stalking, lewd, deceptive Trump. The live SNL audience was cracking up, but apparently the real Trump wasn't. In a tweet, the Republican nominee said that Baldwin's portrayal "stinks." He also called on NBC to end its "boring and unfunny" show. And he said that SNL was trying to rig the election against him. As CNNMoney's Brian Stelter noted, Trump sang quite a different tune 11 months ago, when he hosted the show. It was the second time he appeared on the show -- he also hosted in 2004, though he has been impersonated dozens of times. Trump has been increasingly targeting the media as the culprit of his poor polling numbers. He has repeated the refrain of a "rigged" election since the virtually tied race started to slip away from him following the first debate on September 26. Since then, Clinton has led most polls by a comfortable margin. Though attacks on the press from political candidates are nothing new (Clinton has expressed her fair share of gripes), Stelter notes that Trump's position is far more extreme than his predecessors.